Who doesn’t love to have a tasty breakfast while in the middle of nowhere? Of course, such an opportunity is hard to pass up. A good breakfast is never complete without the crispy crunches of bread. And what if you can get that homey touch and taste in the wild? Yes, it is possible and thanks to the toaster manufacturers who contributed in making it possible. Looking into the demand and requirements of the travelers, a variety of camp toasters are introduced over time but the selection of the best camp toaster amongst them might not be an easy job. It’s easy to think that all the camping toasters available in the market are passable and specially made for the outdoor travels. Some might look fancy, others are lightweight and simple and so on. However, don’t you ever decide one on the basis of this criteria. If you do so, this will only result in frustration and disappointment and may easily spoil the rest of your outdoor trip. We are going to tell you about the widely liked and top-rated camping toasters to avoid frustration after deciding which model to buy. What is a Camp Toaster? We all know what a toaster is but a camp toaster? What is the difference between a simple toaster and the one designed for camp? In fact, both are used for preparing crispy toasts but the way they are used to prepare is divergent in nature. Unlike the typical home toasters, you are not going to get a couple of prepared bread with a beep from the machine with a camping toaster. Yes, the difference is in the method of preparation. As mentioned earlier, the scarcity of resources in the wild is not exactly going to make it easy on your end. The camp toaster is thus the name of the method utilizing the limited available resources in order to have that delicious bite of crunchy toast. The home toasters available so far are made up of different materials like plastic and metal. Both having its own pros, cons and level of ease in operation and results. But in the case of camping toasters, we do not have an open option of changing the material easily. The reason is none other than the outdoor environment where almost all of the toasters are operated either an open fire, burning coal or propane gas. 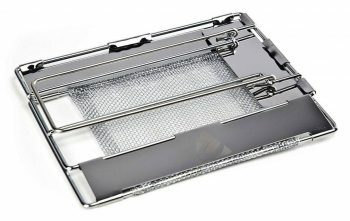 The common and acceptable material for these toasters is stainless steel and alloys of metal. The plastic material is simply not viable especially in the fire or burning coal types. Keeping this in mind, the only material suitable for it are stainless steel and alloy. The ones we will be reviewing later are mostly composed of these materials. It is known that steel and alloys are quite denser in nature and it will definitely increase the weight of the item. Therefore, you do not have to forget the very basic requirement for outdoor gear: all the items you carry must be lighter in weight and can easily fit in your backpack. In this perspective, manufacturers have chosen the usage of less dense alloys like aluminum and other metals of this class. If the toaster you liked have all the bells and whistles but is heavier in weight, it might be a good idea to pass on that particular model. It is because no backpacker would actually want to lug around such a heavy piece of equipment especially when he or she is in on a particularly lengthy hike. The size and dimensions of any outdoor gear and equipment is an important consideration for any self-respecting backpacker. The dimensions of any product are the foremost considerations in making a decision of choosing one especially for outdoor trips. As far as the camp toaster is concerned, you will obviously want a model with smaller dimensions so that it won’t take much space in your traveling gear or backpack. But hold on, in the case of toaster this is quite a difficult decision to make. It is because the smaller camp toaster, the lesser number of toasts will be prepared. If you are a solo traveler, go for the one with smaller dimensions but if it is a group of many, choose one according to your need. It would be counterproductive to make toasts for a group of people with a toaster that only has a capacity for one. This feature is very closely related to the dimensions or size of the toaster. Most of it whether a home or outdoor variant is capable of preparing two pieces of bread slices. However, there are other available varieties capable of making four or even eight bread slices in one round in the camp toasters. Although yielding the same number of toasts, the major difference lies in the timings between the two. Home toasters are fast, quick and user friendly with a click of a button while outdoor toasters require manual steps in order to operate. So, the best choice on the basis of this feature is to be made in accordance with the dimensions or size of the toaster. Fortunately, there are certain types available with varying factors which makes it easy to choose like foldability option, assembly and reassembly of the parts and more. The design and looks of most camp toasters are not quite fancy like the ones we use in our homes. Most of them are quite simple in design because modifying the very basic camp toaster which is hardly a plate with racks is going to add on the weight and size of the product. The recommended choice is, therefore, having the design factor aside and prioritizing others. Once other requirements are fulfilled, the design can be considered at the end without overlooking the best features of the toaster. So far, you have learned a lot more about the camp toasters and the features you need to consider. Below, we have reviewed some of the top-rated camping toasters which could give you the best and crunchiest toasts while you’re in the middle of nowhere. The Camp-A-Toaster CT1 is liked by most of the consumers due to its multiple unique features especially the capacity of toasting about eight bread slices simultaneously. It is easy to use and works on a grill, campfire and camp stove. It is also good to use at home on an electric stove or gas and thus can serve you both indoors and outdoors with efficient results. 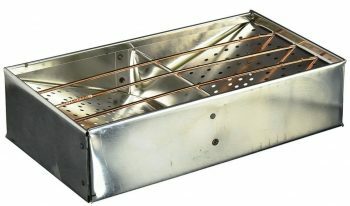 It is not only capable of toasting bread but also can toast other goodies like sandwiches, buns and muffins and more. Another standout feature is the price point which is very affordable. The Ezyoutdoor Camp Stove Toaster is a simple designed outdoor toaster with minimal weight and size. This product has passed the FDA food safety test and is an incredible toasting tool that provides wonderful results. A highly durable product which you can fold and makes it an ideal choice for backpackers and campers. 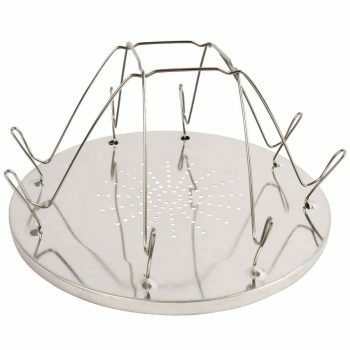 It has a perforated plate with numerous holes making it usable for multiple purposes like heating your meals. If you are looking for a durable and smaller sized camp toaster, this one is for you. DeltaToast is ideally suitable for small kitchens, RV’s and townhouses where you have limited choice of space. Although specifically designed with a compact profile and adjustable bread slots for home use, it is still a solid option for camping and other outdoor activities. It is also can be used to prepare a nice sandwich. The unique feature of this toaster that’s unlike other similar products is that you won’t need to flip the bread slice as it can be cooked evenly without doing so. Since the bread slice resides in a vertical / perpendicular position, the heat uniformly reaches the entire surface of the bread. The Coleman Camp Stove Toaster is another cleverly designed camp toaster. 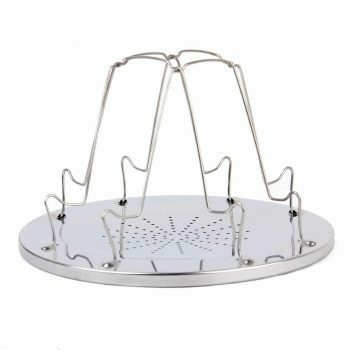 The simple design consists of a plate and foldable prongs which are quite easy to use and easy to transport during your trips. This toaster easily fits onto any of your camp stove, grill or propane gas burner and gets you the perfect toasts for your breakfast not only outdoors but also in your home as well. Just place it over the stove and experience the very best “camping toast” while you’re preparing to tackle the adventure ahead of you. 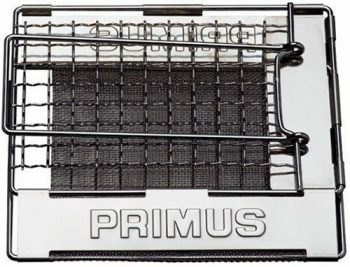 The Primus Toaster is quite a popular toaster due to its innovative design. 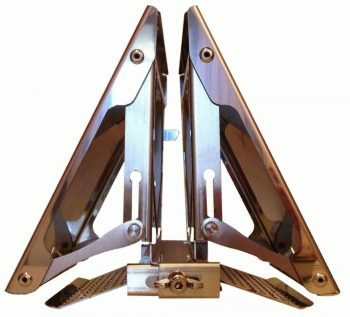 Made up of stainless steel with a rectangular shape, the easily collapsible assembly is a true selling point for customers because it can help them save space while backpacking or camping. Being lightweight, it is highly portable and yields the best delicious toasts while in the wild. It is all possible because of the mesh net which helps in the even distribution of the heat, turning your bread into a tasty toast in minutes. This toaster is not only useful for outdoor purposes but you can totally use it at home as well. The Stansport Camp Stove Toaster is a highly durable product for both indoor and outdoor toasting. The high quality and extensive durability are due to the use of special rust resistant steel. This toaster can easily fit into a camp stove, open fire and gas burner. With the ability to toast about 4 bread slices in a single time, it’s a great option for group outings. It has a simple design and thus easy to use with no special skills or tools required. For this cheap price, it’s hard not to recommend this particular toaster. The Chinook Plateau Folding Toaster is yet another small, highly durable and uniquely designed toaster. The lighter weight of this product makes it easy for transportation which is perfect for any outdoor purposes. It can also toast fairly quick which is nice. The uniform and even toasting is made possible by the net mesh where the bread slice is placed which results in some delicious toasts. Highly recommended especially when it is such an affordable product. For many people, the concept of camping toasters can be a foreign one. However, it is indeed a thing and you don’t have to deprive yourself with a nice breakfast just because you are out on the wild. With this article, we hope that you have learned a lot when it comes to shopping for an outdoor toaster that you could for your backpacking or camping trips. So have you used a camping toaster before? What do you think of our selection of toasters above? Feel free to let us know in the comments section! TOP GEAR PICKS Best Women’s Ski Jackets: Which One’s Worth Your Money?